Sandstones eroded into scenic hoodoos, windows, gulches, cliffs, pedestals and mushroom caps. Nice, small BLM picnic/campground facility in a secluded location with opportunity to take undefined exploration hikes on ridges and in the adjacent valley. 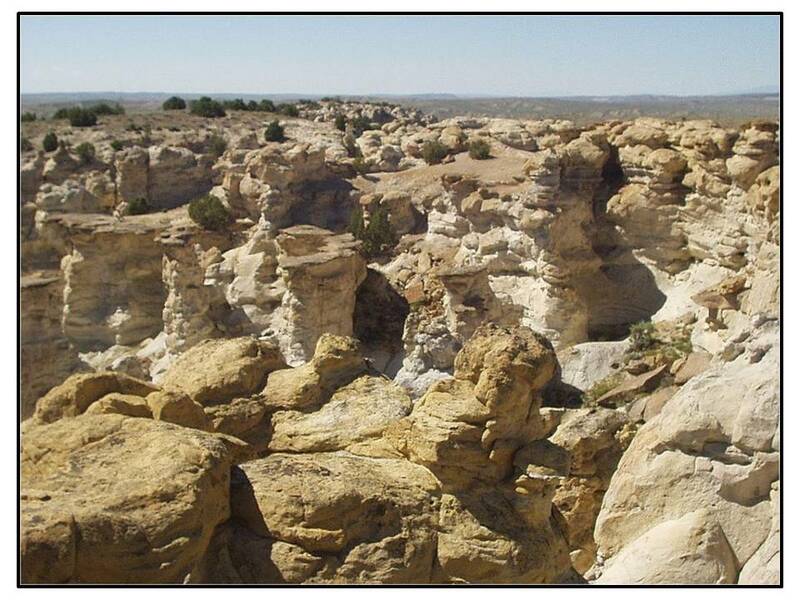 Castle Gardens is an area of badlands topography seven miles southwest of Tensleep, developed in the upper Cretaceous Teapot Sandstone Member of the Mesaverde Formation. The distinctive mainly white sands of the Teapot Member present a landscape of cliffs and towers that resemble the ramparts of a medieval castle. This Castle Gardens in Washakie County is not to be confused with the Castle Gardens Petroglyph site about 60 miles south in the Wind River Basin, Fremont County. The Mesaverde Formation in the Bighorn Basin is composed of sandstone, siltstone, mudstone and coal deposited in the distal or eastern side of the Sevier Foreland Basin at the margin of the Western Interior Seaway. The formation underlies the Meeteetse Formation and interfingers with, and overlies the Cody Formation. Regionally the strata thin from west to east, and from north to south. The Mesaverde becomes more marine to the east and more continental to the west. The Mesaverde can be subdivided into four units: upper (Teapot Sandstone), middle, Claggett, and lower members. The lower member is a regressive (sea level fall) sandstone. The Claggett member is a offshore shale tongue of the Cody Shale that separates the middle and lower Mesaverde members. The middle member is a mixed clastic sequence of sandstones, siltstones, mudstones and coals deposited as the Western Interior Seaway retreated to the east. An unconformity (erosion surface) separates the upper and middle units. The uppermost member is the Teapot Sandstone which is a nonmarine unit throughout most of the basin. Hummocky bedding in the southeastern Bighorn Basin suggests that the unit becomes marginally marine here. Bighorn Basin Upper Cretaceous stratigraphic chart. Image: After Finn, T.M., Kirschbaum, M.A., Roberts, S.B., Condon, S.M., Roberts, L.N.R., and Johnson, R.C., 2010, Chapter 3: Cretaceous–Tertiary Composite Total Petroleum System (503402), Bighorn Basin, Wyoming and Montana: USGS DDS 69-V, Fig. 7, p. 10. View of castle walls and towers from picnic area. Left: Mesaverde Formation outcrop description from Deadline Draw (12 miles south of Castle Gardens). Note that only the upper two members are present in this area of the Bighorn Basin. ​Right: Thickness Map Mesaverde Formation. Contour interval is 250 feet. Red dotted line marks the western limit of Claggett Shale Member deposition and the western margin of the marine seaway. The blue dashed line marks the eastern limit of the Claggett Shale tongue and eastern limit of the Lower Mesaverde. The Lower Mesaverde deposited in a coastal to shallow marine environment thins to the east and disappears east of this line. The marine Claggett then merges with the underlying marine Cody Shale and is all called Cody. Location of well log cross section A-A’ and Deadline Draw outcrop are posted. 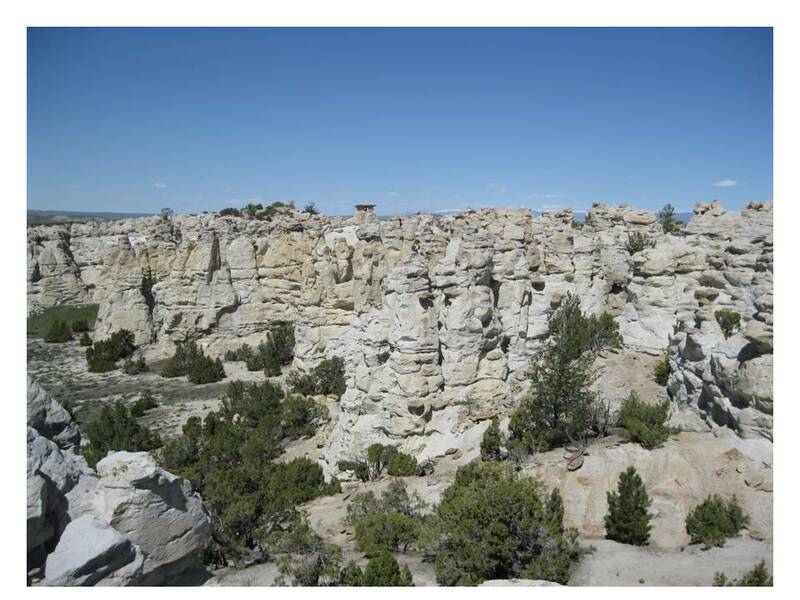 Images: Left: After Johnson, R.C., Keefer, W. R. Keighin, C. W. and Finn, T. M., 1998, Detailed Outcrop Studies of the Upper Part of the Upper Cretaceous Cody Shale and the Upper Cretaceous Mesaverde, Meeteetse, and Lance Formations, Bighorn Basin, Wyoming: WGS Guidebook, Plate 1. Right: After Finn, T.M., Kirschbaum, M.A., Roberts, S.B., Condon, S.M., Roberts, L.N.R., and Johnson, R.C., 2010, Chapter 3: Cretaceous–Tertiary Composite Total Petroleum System (503402), Bighorn Basin, Wyoming and Montana: USGS DDS 69-V, Fig. 14, p. 19. ​Badlands are created by erosion at the earth’s surface. Several features characterize this landform (see Geowyo Devil’s Kitchen page). A common feature at Castle Gardens are large rock “mushrooms” and “toadstools.” These occur when a well cemented, resistant sandstone lies on top of less resistant beds. The resistant, cemented units are often red-orange stained from weathering of iron minerals. Cross section A-A’ in southeastern Bighorn Basin, from Worland Field to a dry, wildcat well on south flank of Banjo Anticline. The Mesaverde Formation thins as the Cody Formation thickens to the south and east in the Castle Gardens area. 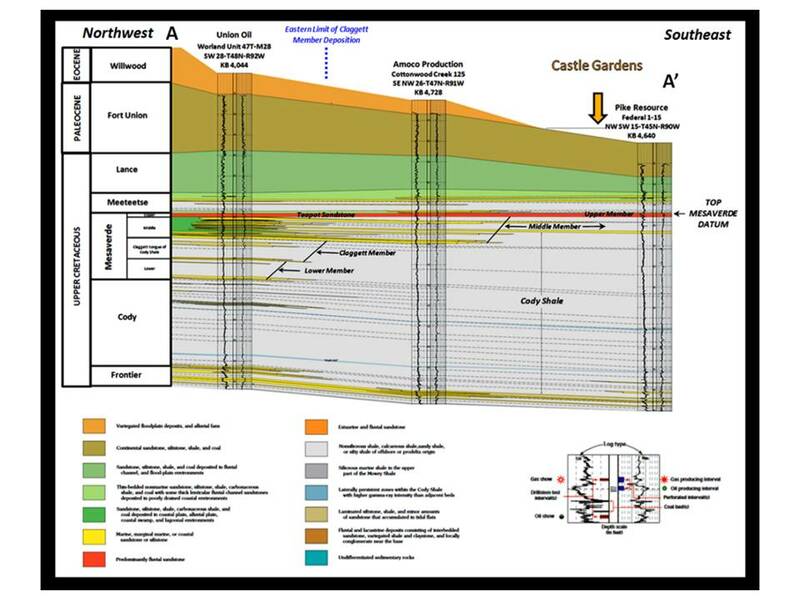 Geologic Map of Castle Gardens Area. Geologic notation: Qa: Quaternary alluvium, Qac: Quaternary mixed alluvium and colluvium, Qls: Quaternary land slide, Qsw: Quaternary slope wash, Qt: Quaternary terrace deposits, Twl: Tertiary Willwood Formation, Tfu: Tertiary Fort Union Formation, Klm: Cretaceous Lance and Meeteetse Formations, Kmv: Cretaceous Mesaverde Formation, Kc, Cretaceous Cody Formation, Kf: Cretaceous Frontier Formation, Kmt: Cretaceous Mowry and Thermopolis Formation, KJ: Cretaceous Cloverly and Jurassic Morrison Formations, Js: Jurassic Sundance Formation, JTrgc: Jurassic Gypsum Spring and Triassic Chugwater Formations. ​The Castle Gardens badlands is the type of eroded landscape that French-Canadian fur trappers called “les mauvais terres pour traverse” (bad lands to travel through). For Bighorn Basin Sheepherders most of the basin was “les mauvais terres pour les moutons de voyager a travers” (bad lands for sheep to travel through). On the night of April 2, 1909 this was tragically demonstrated at a sheep camp south of Tensleep at the mouth of Spring Creek. In 1905 the U.S. Congress established the Forest Service from the earlier Timber Reserves to manage public lands reserved as national forests. They created a system of regulations that included permits, herd limits, grazing seasons and fees. But the open range of the non-forest public lands continued to deteriorate until passage of the 1934 Taylor Grazing Act. The cattlemen established “deadlines” to set grazing boundaries between cattle and sheep on the unmanaged public lands. The word “deadline” originated in the American Civil War at Andersonville Prison (Fort Sumter) in southwestern Georgia. A light fence was placed about 19 feet from the stockade walls. Anyone crossing or touching the line could be shot. Deadline at Andersonville Prison. Left: NPS Historic photo from August 17, 1864. Right: Detail from survivor Thomas O’Dea’s drawing. ​The deadline in the Bighorn Basin used streams, hills, valleys, and roads to mark the boundary. Sometimes, as at Deadman Draw, a furrow was plowed or signs were posted. 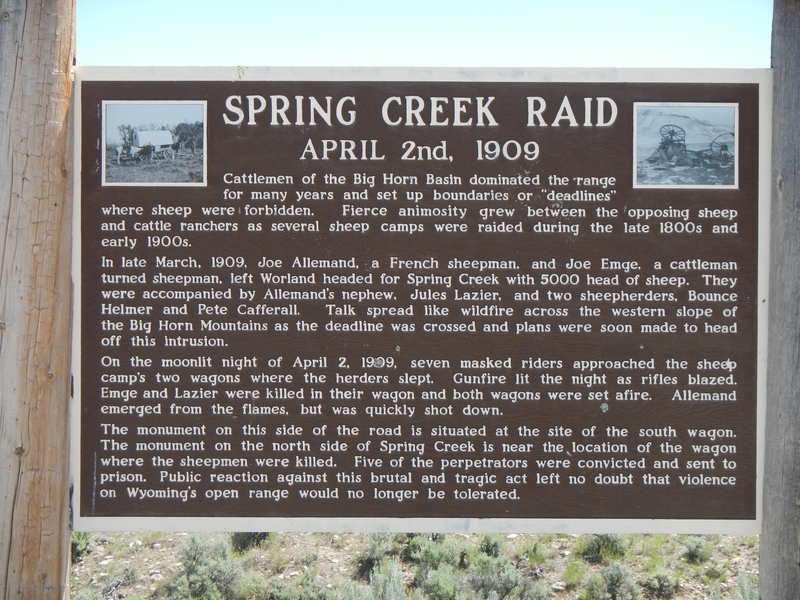 Between 1879 and 1909, Wyoming had about two dozen raids on sheep camps with six sheepmen, several dogs and 18,000 thousand sheep killed. Several thousands of dollars of property had also been destroyed. Tensions were high. Image: Google Earth; Data: Davis, J.W., 1993, A Vast Amount of Trouble: A history of the Spring Creek Raid: University Press of Colorado, Niwot. Joe Allemand and his partner, former cattleman Joseph Emge, chose to cross the established deadline to take their herd from their ranches on Spring Creek to winter pasture near Worland in 1908-1909. Ironically, Allemand was well liked by the community as a whole, homesteaders, sheepmen and cattlemen. Emge on the other hand helped plow some of the deadlines and reportedly was involved in some early raids on sheep camps. He was viewed as a traitor by some of the cattlemen. They had a local deputy sheriff for protection on the drive to Worland. They did not have a lawman accompany them on the return. After five days they were back on their side of the deadline at a camp along Spring Creek. That night seven masked men attacked while the sheepmen, feeling safe, slept. They killed three men, four dogs and at least 25 sheep. The wagons and the dead men were soaked with kerosene and burned. The population was outraged and the Wyoming Wool Growers’ Association offered a large reward. The National Wool Growers’ Association, The State of Wyoming and Big Horn County (Washakie County was not established until 1911) also offered cash to bring the perpetrators to justice. Before this event, no cattleman had been convicted in Wyoming for violence against sheep or their herders. The seven raiders were identified and brought to trial. Two of the raiders turned on the others for immunity. The other five were convicted and sentenced to time in the Wyoming Penitentiary. This was the last murderous episode of the cattle-sheep wars in Wyoming. 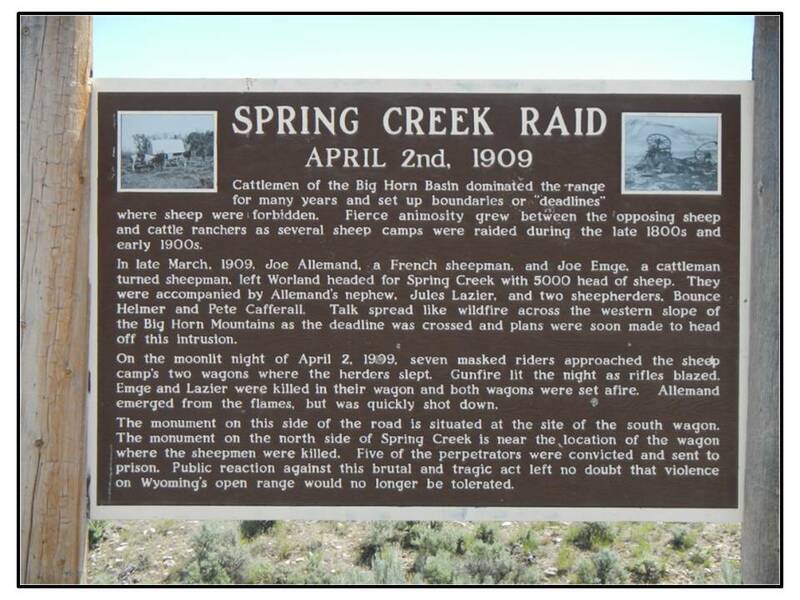 The Wyoming Department of Transportation has placed a roadside sign and monuments marking this site. Joe Emge has a nearby creek named after him. A short video of the raid from the University of Wyoming Extension: https://www.youtube.com/watch?v=flVenx-hHks. WDOT roadside marker along Wyoming State Highway 434 about seven miles south of Tensleep. A 20 minute drive from Tensleep on paved and mostly gravel road that can easily be accessed with a passenger vehicle. There are four campsite/picnic sites with grills and tables. Three of the sites have a shelter to protect from the rain. There is no water. There is one outhouse. ​To appreciate Castle Gardens you will need to walk and explore the ridges and perhaps the adjacent valley to the west-southwest. Just driving through does not do it justice. 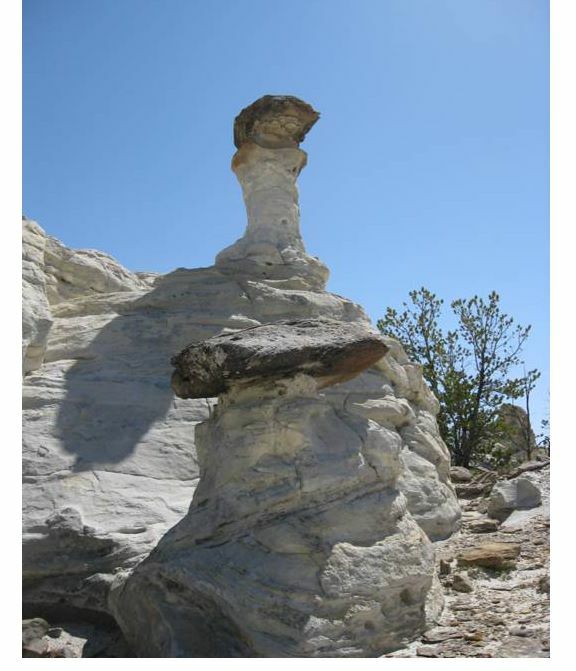 We recommend you allocate about an hour to explore and enjoy the sandstone erosional features. Be careful, there are some drop-offs and cliffs. You will need to supervise the kids. This place can get hot and sunny in the summer so time your visit. Starting in downtown Tensleep at Dirty Sally’s, head west on US 16 toward Worland, 0.7 miles cross Nowood River, 1.0 miles Tensleep Brewing on right, 1.5 miles Tensleep fault has caused the steeply dipping beds adjacent to the road, 2.1 miles turn left on gravel road, 2.4 miles reach T and turn right on Old Tensleep Highway, 3.3 miles turn left onto Two Mile Hill Road, 3.9 miles go straight at intersection with W T Stock Drive, 7.6 miles take right fork in road onto Castle Gardens Road, 8.2 miles arrive at Castle Gardens.